More than seven out of 10 South Koreans saw the need for parliamentary ratification of the April summit agreement between the leaders of the two Koreas, a poll showed Monday. In the survey on 1,005 South Koreans, 71.8 percent of the respondents said that the National Assembly needs to ratify the April 27 summit declaration, while 13.6 percent opposed parliamentary approval. The poll was commissioned by the parliamentary speaker's secretariat and conducted by Gallup Korea from Aug. 21-22. President Moon Jae-in and North Korean leader Kim Jong-un held a historic summit in April, which calls for North Korea's complete denuclearization and the recovery of inter-Korean relations. They held the second summit in May and will have another in September. The survey showed that 73.5 percent of the respondents assessed that the April and May summits fared well, while 14.3 percent gave a negative assessment of the results. It said that 87 percent think that the National Assembly should play a key role in handling security and foreign affairs. 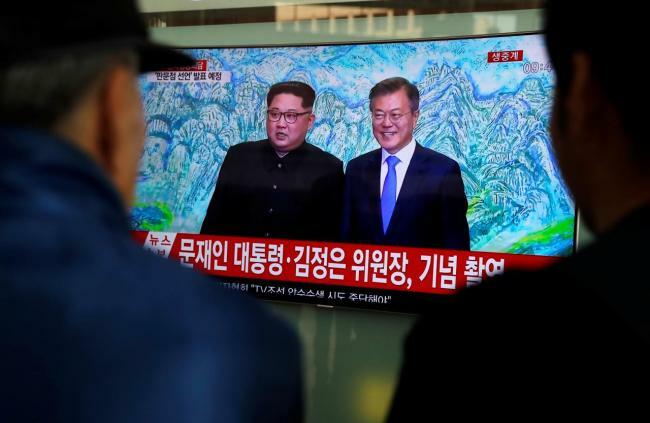 In late May, rival parties failed to adopt a resolution to support the April summit as they differed on the wording with respect to North Korea's denuclearization. Parliamentary speaker Moon Hee-sang called for opposition parties' cooperation in ratifying the summit declaration at his regular meeting with the floor leaders of the ruling and opposition parties. "President Moon will feel confident if the April deal can be ratified before the third inter-Korean summit," Moon said at the starting of the meeting. "Opposition parties should actively cooperate if needed. The National Assembly should be supportive," he added.